During Cenozoic and late Mesozoic time, sediment accumulated in the Raggatt Basin on the southern Kerguelen Plateau. We describe the seismic stratigraphy of the Raggatt Basin, utilizing multichannel seismic (MCS) data obtained by the Bureau of Mineral Resources, Geology and Geophysics (Australia) and the Institut de Physique du Globe de Strasbourg (France). Seven major seismic stratigraphic sequences in the Raggatt Basin overlie a basement complex of Early Cretaceous age. The underlying basement complex is characterized by two types of seismic images: acoustic basement and a layered basement which includes dipping reflectors. 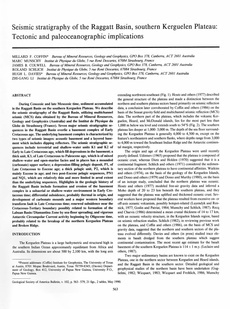 The seismic stratigraphic sequences include terrestrial and shallow-water units K1 and K2 of Early to Late Cretaceous age, which fill depressions in the basement; a thick unit, K3, of Late Cretaceous to Paleocene age, which is of mixed shallow-water and open-marine facies and in places has a mounded (carbonate) upper surface; a depression-filling pelagic deposit, P1, of Late Cretaceous to Eocene age; a thick pelagic unit, P2, which is mainly Eocene in age; and two post-Eocene pelagic sequences, PN1 and NQ1, which are relatively thin and more limited in areal extent than the underlying sequences. Highlights in the geologic history of the Raggatt Basin include formation and erosion of the basement complex in a subaerial or shallow-water environment in Early Cretaceous time; differential subsidence, probably thermal in origin, and development of carbonate mounds and a major western boundary transform fault in Late Cretaceous time; renewed subsidence near the Cretaceous-Tertiary boundary possibly related to formation of the Labuan Basin/Diamantina Zone by sea-floor spreading; and vigorous Antarctic Circumpolar Current activity beginning by Oligocene time, probably related to the breakup of the northern Kerguelen Plateau and Broken Ridge.